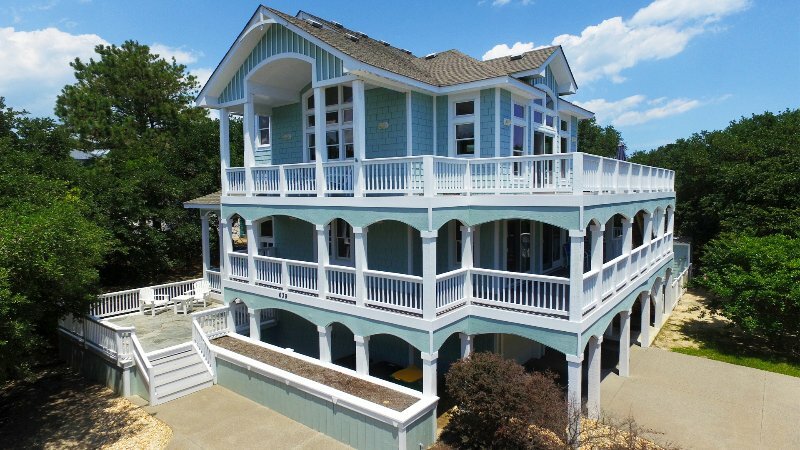 Eagles Landing is a luxury 5 bedroom home in the heart of The Currituck Club of Corolla, NC. The home is a professionally decorated home on the #10 fairway and is conveniently located near the resort recreation amenities. Eagles Landing was featured in the Outer Banks Parade of Homes in our first year. *** We are a new listing here on Trip Advisor, but our home has been listed on other sites for over 10 years, hosting hundreds of great guest stays. Our other listing has over fifty 5-star reviews. Please inquire, and we'll tell you more! Be our guest at Eagles Landing and enjoy your vacation in a large professionally decorated living space with golf course views, private pool, home theater, and a game room with pool table. Enjoy your day at The Pine Island Beach Club with an uncrowded beach and a beautiful oceanfront pool. From our Hunt Club Drive location, it’s a short walk to the resort golf course, tennis courts, fitness center, playground and community pools. The Harris Teeter grocery store is just around the corner. The craftsman style interior is beautiful natural wood trim and floors with high vaulted ceilings, ceiling fans, large windows, and granite counter tops. The house interior was professionally decorated by The Urban Cottage of Duck, NC with Coastal Living style of bright colors in nautical and golf themes. The large kitchen has everything you will need for preparing, dining, and entertaining. There is table seating for 12 to dine plus a granite top bar with bar stools for just hanging out. There is a full size under counter ice maker. It is stocked with high quality cooking, dining, and bar ware from Crate & Barrel and Williams Sonoma. The house is equipped with a Culligan water system bringing you sparkling clean water throughout the house. The house is filled with entertaining amenities like high end electronics and a game room with a pool table. The great room has a large ultra 4k TV and Bose surround sound and is the perfect setting for your evening movie with the family. The game room with pool table also has a large screen TV and sitting area. There is a wet bar and mini refrigerator and patio door leading to the outside pool deck. Each bedroom has patio door access to the exterior decks, and each contains a flatscreen TV with cable access and a Bose Wave Radio or Boston Acoustic Radio. Bed linens are included with beds made for your arrival. Currituck Club Beach Access – features a complimentary trolley service which will take you from the house to the beach. At the beach center there are people to help you carry your stuff from the trolley to your place on the beach. Beach chair and umbrella rentals are available daily or weekly, and refreshments can be purchased at the beach center. Pine Island Beach Club – the preferred beach access features a beautiful oceanfront pool and a very uncrowded beach experience. There are restroom facilities and refreshments available. The Currituck Club offers 18 holes of championship golf designed by award winning golf course designer, Rees Jones. The course was rated one of the ’10 Best New Places You Can Play’ by Golf Magazine and in May of 1999 Golf Digest recognized The Currituck Club as one of the ‘Top 25 Courses in North Carolina.’ There is a pro shop, a grass tee driving range, and PGA instructors. As our guest, you will receive golf privileges, discounted greens fees, and priority tee times at The Currituck Club course. In addition to the golf course at The Currituck Club, there are many recreation facilities in a short walk from the house. There is a large community pool, tennis courts which are lit for night play, a fitness center with game room, basketball, volleyball, and there is a playground. In the summer months there is a weekly pool party with barbecue, and there are kids activities like a movie night at the pool. Eagles Landing has concierge services provided by At Your Service. Would you like the refrigerator to be stocked when you arrive? Would you like somebody to buy your groceries while you go to the beach? Would you like a private chef to prepare a meal for you at the house? Would you like daily maid service? Do you need somebody to run errands? The Concierge is on call will take care of it for you. *** We have never listed our home on Craigslist, and we will never list on that site. If you see our home on Craigslist, it is a fraudulent listing. We never request or accept wire transfers for payment. We are the owners of this home, and we spend a lot of time at the house throughout the year. We have at least one summer week for our vacation, and we have frequent stays throughout the off season. So we can provide you the best first hand traveler advice for the beach, golf, dining, shopping, activities, and arrival/departure travel. Just inquire and let us know how we can help!